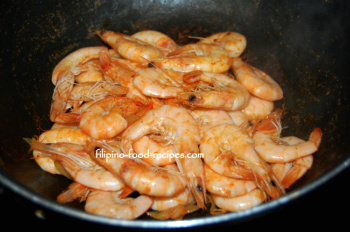 Halabos na Hipon is merely a basic way of cooking shrimp where head, tail and everything else is intact, stirred in a pan with a little water right until it changes color. The shrimps are not deveined through the shell, they're just washed, with the antenna or the long whiskers cut, and the sharp pointed rostrum (above the eyes) trimmed out. Using just plain water is standard, but a little is needed as the shrimp have residual liquid in it. A friend from Pangasinan introduced me to cooking the halabos with Sprite or 7-up. I have been doing that and liked the hint of sweetness the soda brings. ...(and I do the same for crabs, too). Now, back to the shrimps, it is important to know that they cook real fast and can get tough if overcooked. Have you had shrimps where the shell is stuck too much to the body making it (the shell) difficult to pull out? And after so much effort of getting the flesh out, they're rubbery and chewy. These are signs of overcooked shrimps. A perfectly cooked shrimp takes just a couple minutes to cook, once it changes color, give it a minute more on the pan and they should be done. 1 Wash the shrimps, trim out the antenna or whiskers, cut the sharp pointed rostrum above the eyes. 2 Set the shrimps on a pan, add all other ingredients. 3 Cook over medium heat, mixing continously until the shrimp changes color, about 3-4 minutes. 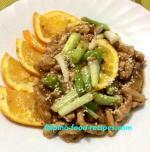 4 Serve with a vinegar/garlic or calamansi/fish sauce dip. If you want to infuse garlic and onion flavor, sprinkle garlic and onion powder on the shrimp right after they're cooked. The flavor will meld in once it is eaten since you cannot get into the shrimp meat without touching the seasoned shell. Another good seasoning to try is Old Bay. It's usually sprinkled on crabs after boiling them, but it is just as good on shrimps. If you buy the large shrimps or even prawns, you might want to run a paring knife at the back of the shrimp to devein. However, if you don't mind eating the black digestive track, just leave it as it is. No Sprite or 7-up available? Just use plain tap water and add a pinch of sugar.